Last week we showed you the 10 other things you should never bring with you to a gunfight. 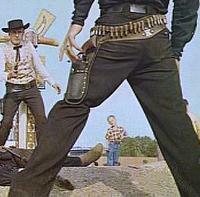 Unfortunately, many of you went to gunfights underprepared, and most of you were killed. We felt it our responsibility to post the 10 things you can’t afford to be without at a gunfight. 10. CANNED YAMS – Ever eat one? Those damn things fly out of there faster than a speeding bullet. 9. SNACKS – Well, you never know how long these things may last. 8. SPARE CLIPS – Duh! 7. A SLOW-MOVING WINNEBAGO – This will buy you plenty of time to reload. 6. JELL-O – What, Gooley can say it but I can’t? 5. CELL PHONE – No one’s gonna believe you actually brought canned yams to a gunfight. 4. LOUIE ANDERSON – At this point, what could it hurt? 2. CELLO (Not Jell-O again!) – Music soothes the savage beast. 1. GPS – You’re not getting out of this one by yourself. I am an award-winning producer in Indianapolis with a passion for writing and making people laugh. If you ever run into me on the streets, there's a good chance I will have just made someone laugh -- perhaps not you, not yet. But your day will come!